British-born Stockholm resident OCH has been experimenting with electronic music since growing up immersed in the world of Acid House and UK Rave. 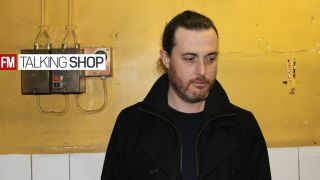 Since 2010 he's been releasing his own productions and remixes, leading up to the release of his debut LP, Time Tourism, which is set to drop on Marc Romboy's Systematic label this month. Ahead of the release, we caught up with OCH to find out how he creates his raw, underground sound. "Well they tried to make me play some classical instruments at school but I wasn't feeling it. I'm left handed and always fancied playing the electric guitar upside down like Hendrix but the teacher didn't go for it and suggested I play bass on the grounds that I would be able to co-ordinate my hands easily. I played in a few bands but by around 94-95 I was engrossed in electronic music. I was buying US like labels Transmat, Direct Beat, German stuff from Basic Channel to Harthouse, Djax-Up-Beats in Holland were pumping out a lot of raw heavy stuff that I was fascinated by, and of course Ifach in the UK was big for me. "My first steps into production were anything but glamorous. I'd love to recall stories of modular synths and elaborate mixing consoles but the reality is me and my friends were unemployed and un-educated in the world of studios. We pooled together our gear (I had an entry level Akai sampler, an Atari ST and Novation Bass Station, one friend had a TR-606, another an Oberheim Matrix 1000, some guitar effects units and we recorded to tape). "The music that came out was very rhythmic, stripped back Techno, the levels were all over the place and it was 135BPM. In a sense this was a great experience as we really had to master these boxes to get anything good out, although it was frustrating as we had no-one to show or help us - no YouTube tutorials!" "At the moment it's a dedicated room in my house, nothing super fancy - it's a good enough shape acoustically. I've been here four years so it's a case of 'better the devil you know'. I have a double garage that I'm slowly converting into a purpose built studio space that will include guest accommodation so I can collaborate with people on a more personal level. "Apart from when I'm recording guitars or vocals or my piano I work entirely in the box. I love hardware synths as much as the next man but I just feel free creatively doing it like this. I don't like to get too bogged down with technology so if I wake up with a riff in my head I want to bring it to life ASAP in the simplest possible way." "Logic Pro is my first choice - I've been using it since the early Emagic days, probably six hours a day for most of my adult life, so can do practically anything with it. With my right hand I use Logic Remote on the iPad for smart controls, transport functions and EQ and jam away on the keyboard or drum module with my left, which is a really effective workflow for me. The instruments and effects sound so good these days that if you're on a budget you could easily make records with just this alone. "I often use Ableton Live to start projects as it just throws away the conventional and you'll get results that are much more creative than what you initially set out to do. After all these years it's still number one for playing live, so I spend a lot of time in there too. "Finally, Reason is my go-to when all else fails. If I really can't get my mojo on this not only cheers me up - as it's such fun to use - but I'm usually in the zone straight away after opening. The Rack Extensions and Re-fills are very inexpensive so you can constantly upgrade your system and it sounds the mutts nuts." "I know it's a bit of a cliche but the Yamaha NS10s. Although I gave up mixing on them years ago they're still great for A/B-ing. Yeah, we've all had some grey-haired ex-rocker tell us that if you can get your mixes to sound good on these they'll sound good anywhere, which has elements of truth, but for me with the music I make getting the low-mid frequencies correct is paramount and these unflattering suckers will expose this right away." "I just picked up the new Spectrasonics Omnisphere. The old one was good but, phew, when I started out I never thought in my wildest dreams you'd be able to get such depth from software. It's like having an orchestra, a choir, a band, all your favourite synths and a tibetan throat chanting ensemble sat in the best studio money can buy. "I'm just experimenting with the Sound Match function - you can load in one of your own samples, hit match and the thing dials up a whole menu of similar sounds from its banks. Seriously nice job guys. Very nice." "Haha, I wouldn't mind one of those Emu Emulator II sampling keyboards. I remember seeing one on Top Of The Pops as a teenager and being instantly intrigued. I probably wouldn't play it - I'd just look at it lovingly and smile at its beauty." "It depends how I'm feeling - I often like to spend a week or so just sound designing and saving banks of pads and chords, etc. for a later date. Sometimes I'm in crate digging mode where I'll be buying up old funk, disco and jazz vinyl for some sampling action. I may play the piano and record the session, record some vocals another day so when I do feel motivated to write some beats it's all there as a resource and lots of tracks come together quickly. There's none of this flicking through synth patches aimlessly trying to find that missing part for your three quarters completed track." "I've just done the Time Tourism double album for Germany's Systematic recordings. If you're interested to hear exactly the kind of styles that are constantly floating around in my head then be sure to pick this one up and above all else - expect the unexpected! I'm also just finishing a 12" for the UK's Trelik imprint - another important label, which I was first a fan of as a youngster. Things have gone full circle as I'm now recording for them." "EQ is a man's best friend. There's nothing worse than a badly EQ'd mix, and it's amazing how many people don't go into too much depth when using EQ. Each of your parts (from the barely audible backing loop behind your drums to your main synth) is a star and needs to be given the VIP treatment and its own unique place in the frequency range. First and foremost use your ears for this but also employ the help of a frequency analyser for fine tuning. I use the one in Logic's Channel EQ. This is great because it gives you a real time indication of exactly where things sit so there's no excuse for frequencies to clash." "It goes without saying that not many of us are lucky enough to have perfect environments for mixing. Even the best trained ears can have an 'off day' due to a variety of external factors. My advice is have two sets of monitors minimum in your room, two sets of headphones and access to a wide range of listening devices. Check your mixes out in your friends' spaces but beware of hi-fi speakers that can be over kind, and club PA systems which can overwhelm you with sheer volume, throwing things out of perspective. Once you're happy that the mix sounds pukka on all of them, then chances are you've nailed it." "It can be all too tempting at ten to six in the evening to sum up your days work, nod your head and think you've smashed that track. Ten minutes later it's in the inbox of some unfortunate label manager who has the pleasure of checking your caffeine fueled ego work-out. Don't do this. Take a break from it for a few days, a week a month or even a year in extreme cases - you'd be surprised at what comes to you by means of how you can take the track to the next level creatively and sonically with little more than a good nights sleep and a fresh set of ears."